How to import MP4 files into FCP X on Mac? MPEG-4 Part 14 is an instance of the more general ISO/IEC 14496-12:2004 which is directly based upon the QuickTime File Format. MP4 (MPEG-4 Part 14) is a digital multimedia format most commonly used to store video and audio, but can also be used to store other data such as subtitles and still images. We can download MP4 movies/video from websites, record 720P MP4/Full HD MP4/4K MP4 video via Panasonic Lumix GH5s, Samsung NX1 or DJI. If you are Final Cut Pro user, you've come to the right place. This guide will show you how to import H.264/H.265/XAVC/ XAVC S MP4 into FCP X on Mac. Hi, I need a tool that can help me to import 4K MP4 footage to Final Cut Pro X for editing, the MP4 files are recorded by Pamasonic camera which I bought several days ago, the videos are H.265/HEVC MP4 files, I was told that FCP X native supported codec is Apple ProRes codec, will this codec help me? Please give me some suggestions on the way to import 4K footage to Final Cut Pro X, thanks for your time. Why I can't play Sony FDR-AX100 recorded XAVC S .mp4 video into FCP X smoothly? And I spent long time on rendering the videos, the exported document is not what I want. I have to repeat the job. It's really a trouble. Why can't import MP4 to Final Cut Pro X natively? We can Import, playback, and editing of HEVC/H.265 video clips and HEIF photos from Apple devices. But we can't edit videos from other channels. If you also meet H.265 editing issues in Fianl Cut Pro X, you probably have searched the method to death but still didn't find the effective way. After you know FCP X supported media format, you will discover that it lools like transcoding H.265 to FCP X native editing codec. To transcode HEVC to FCP X ProRes easily and quickly, HEVC/H.265 Converter is needed. XAVC-S (4K, HD, Proxy)/XAVC (Proxy) MP4 format is becoming popular, because there are several popular camcorders produced by Sony use XAVC-S/XAVC MP4 format to store high-definition data, which can help you to record HD content with high quality. As more and more users use Sony new camcorders, more problems are asked on forums or websites, one of this is how to import MP4 to Final Cut Pro X on Mac computer, many users have find that they can"t import MP4 recordings to Final Cut Pro X smoothly. This special format has not been well supported by FCP X on Mac OS, so uses who want to import MP4 to Final Cut Pro X for editing will encounter video codec/format compatibility problems. 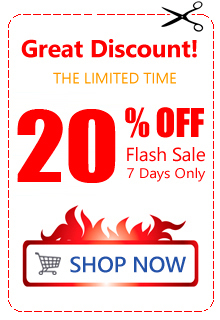 In this case you will need to find another way to import MP4 to Final Cut Pro X for editing. How to import MP4 to Final Cut Pro X and editing with best supported codec? Best effective way to import MP4 to Final Cut Pro X on Mac, you will know how to edit MP4 files with FCP X natively with the help of MP4 to FCP X converter. As XAVC-S and HEVC format is for 4K recording but not playing or editing, so the best effective way is to convert MP4 to Final Cut Pro X native supported codec/format, and then you can edit the videos without any issue. From Apple official page you will get the information that Final Cut Pro X best supported video format is Apple ProRes codec .mov format, once you convert MP4 to Apple ProRes codec, you don't need to render when you importing or exporting, and you can edit videos smoothly. You just need a MP4 to FCP X converter now. Which software is the best MP4 to FCP X converter? Acrok Video Converter Ultimate for Mac is top MP4 to FCP X converter on Mac we recommended, this program will help you to convert MP4 to FCP X best supported Apple ProRes codec with no quality loss, and then you can load the footages to FCP X for editing as you want. This MP4 to FCP X converter has many presetted formats for output, such as Apple ProRes 422/4444 codec for FCP X/7/6, AIC codec for iMovie and Final Cut Express, DNxHD codec for Avid Media Composer, etc. Besides, this MP4 to FCP X converter can also convert MXF, MKV, AVI, MP4, MOV, AVCHD, MTS and other formats, nearly all the video formats are supported. How to convert MP4 to FCP X best codec? Here are easy steps that you can follow below steps to convert H.264/XAVC-S/HEVC MP4 to Final Cut Pro X Apple ProRes codec, if you also need to convert MP4 to MOV, MKV, M4V, AVI, FLV, etc. the steps are nearly the same. Free download Acrok Video Converter Ultimate for Mac from our website, install and run this MP4 to FCP X converter on your Mac (Mavericks, Yosemite, El Capitan, Sierra and High Sierra). If you also want to convert MP4 files on Windows 10/8/7/Vista/XP, you can also try the Windows version. Load your MP4 files to this top MP4 to FCP X conversion program, you can drag and drop the files, or click the add file button on the interface. To convert H.264/H.265/XAC S to FCP X ProRes codec, you can click "Format" then choose Final Cut Pro -> Apple ProRes 422 (*.mov), this is best codec for Final Cut Pro X/7/6 editing, once converted MP4 to this codec, you won't have any importing or editing problems. Acrok MP4 to FCP X converter has offered powerful customization feature, you can adjust the video and audio parameter by clicking "Settings". Click "Edit", you can trim, crop the MP4 video on Mac. 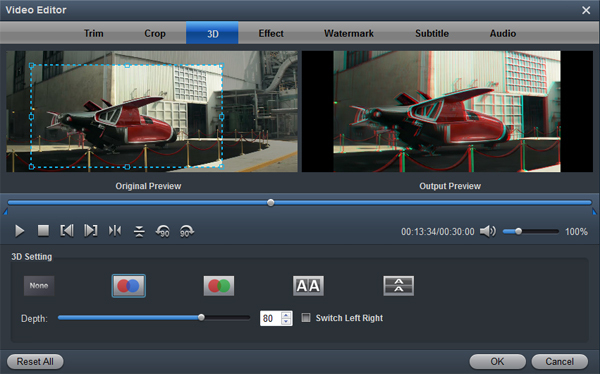 For getting 3D videos, this MP4 to FCP Converter can add 3D effect onto you downloaded or recorded .mp4 video. Click convert button to start MP4 to FCP X supported format conversion. This MP4 to FCP X Converter will convert H.264/XAVC S/H.265 MP4 to Apple ProRes codec MOV format with best video and audio quality, when the MP4 to FCP X Apple ProRes codec conversion finished, you can load the converted files to Final Cut Pro (FCP X, FCP 7, FCP 6) and edit natively, just take a free try now! Besides for MP4 to Final Cut Pro X solution, this MP4 to FCP X converter can also help you to convert H.265 MP4/MKV, XAVC MXF, MPEG-2 MXF, AVCHD, MTS, M2TS, H.264, MPEG-4, etc. 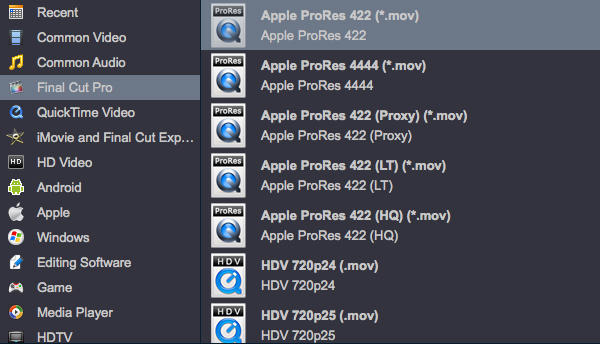 to FCP X Apple ProRes Codec in few clicks. And with this program, you don't need to use complicated log and transfer method, and you don't need to render when loading, it will save much time for you. Acrok HD Video Converter for Mac is a pretty cool program and must for all mac users. Every entertainment fellas must use this program. I can convert MP4/MTS files for FCP X. And so many additional features has been added in the latest version.